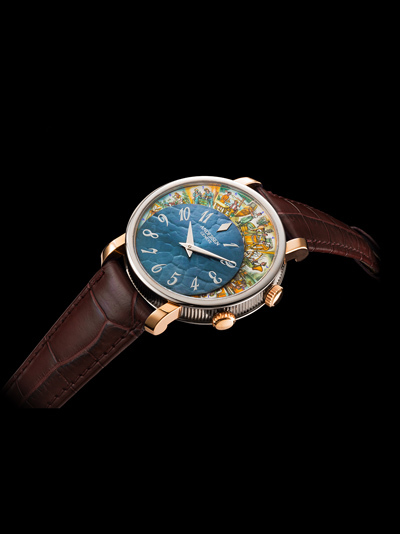 The first timepiece to be presented in this new collection is called “Vita Vinum”. It will be limited to 12 pieces only. The first watch to be introduced in this series is a tribute to wine, honouring the various stages involved in the wine-making process. Wine not only being significant in a gentleman’s life but more importantly the watch celebrates and draws attention to wine grower and wine lovers from the past, present and future. 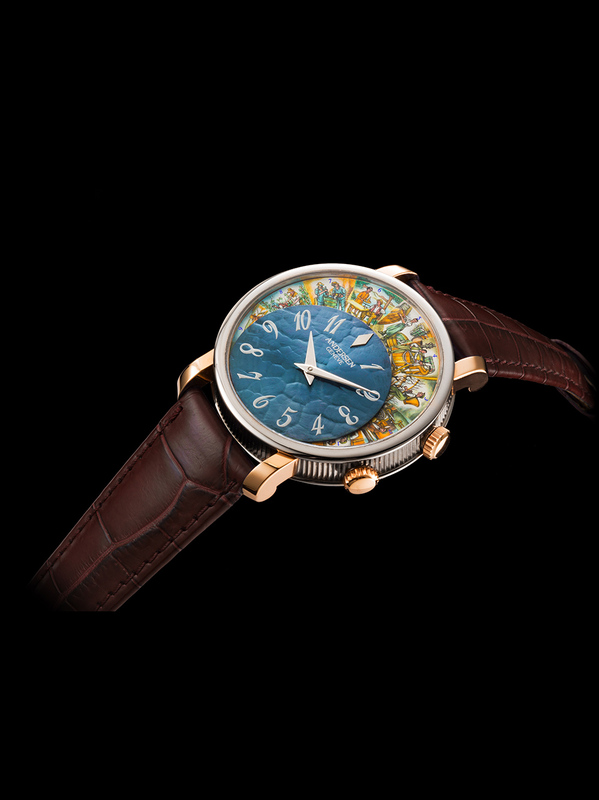 This timepiece has been manufactured in collaboration with different artisans. 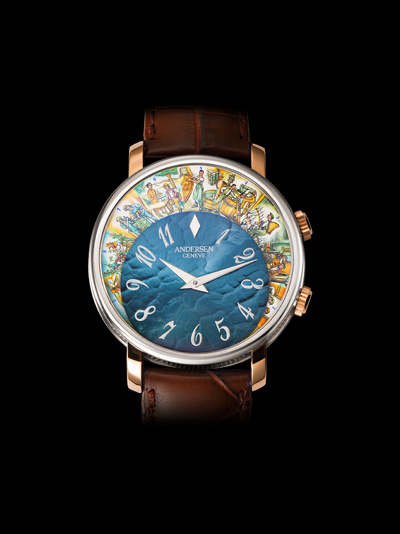 Craftsmanship, for which Andersen Genève is highly regarded, the watch unveils the signature intricacies from the watchmaker to the miniature painter, revealing an exclusive dial made from 21 ct blue gold with “tapisserie” guilloché pattern. The very unique two colors red & white gold case has been manufactured in a traditional way without the use of a CNC machine. Clients will have the choice of hand-engraving scenes on the back of their watch. One rotating disc turning one time in 365 days. It displays the twelve scenes of the wine grower’s work to be done over the year by a Swiss wine grower. A similar process applies for a French, an Argentinian, or an American wine grower and so forth, however it will not happen in the same month. For example, harvesting is much earlier in the Bordeaux Region than it is in Switzerland. The scenes are made by a genious miniature painter using acrylic painting methods. 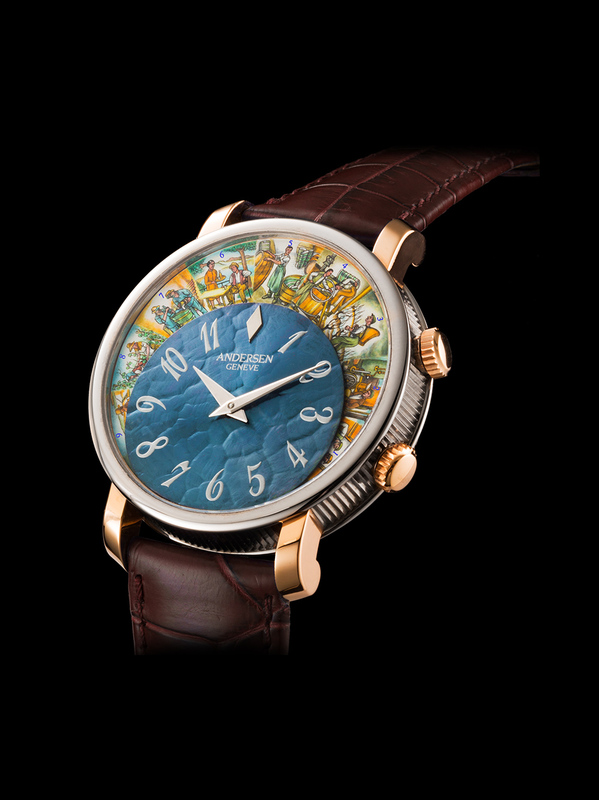 One fixed disc to tell time in 21ct “Blue Gold” with guilloché main “tapisserie” pattern.